Gouges are forged in various sweeps to remove greater or lesser amounts of wood. For example, roughing out the background for a large relief panel would require a tool such as a 9 sweep. The ridges and hollows formed by this tool would then be leveled with a 2 or 3 sweep gouge. 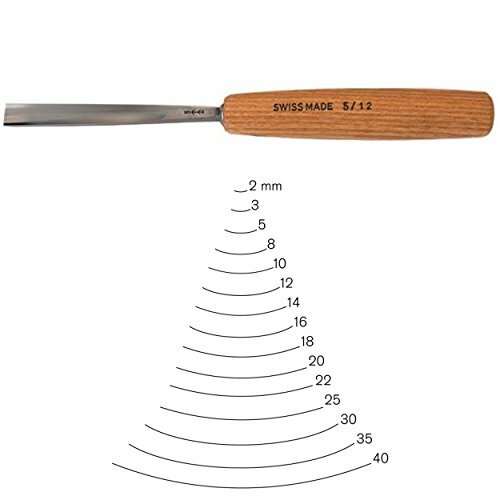 PFEIL carving tools and sets are "Swiss Made". "Swiss Made" implies reliability and precision. PFEIL is undoubtedly the finest carving tool on the market, second-to-none in terms of manufacturing quality and durability. If you have any questions about this product by pfeil Swiss made, contact us by completing and submitting the form below. If you are looking for a specif part number, please include it with your message.